Celebrate your holiday energy reserves with these easy-to-start, momentum building Total Gym ladder sets. These combo sets will challenge your strength, endurance and even cardio with quick transitions and laser focus on two separate movements. A common barrier to resistance training is exercise selection and sequencing. This is where the ladder set shines. You simply select two opposing or separate muscle groups, then quickly switch back and forth from each exercise with no rest. The descending ladder set is a great example, because you start with more repetitions then work your way down the repetition range as you go. It may sound easy but you’ll quickly realize that your rest between sets gets shorter and shorter, so the key to performing at your best is to keep your transition time nominal. Here is an example ladder set using biceps curls and triceps press-downs. **Repeat this pattern all the way down to one repetition each. It’s best to find a level of resistance that is equally challenging to both muscle groups. If you find that you complete the set with one muscle group completely fatigued but the other unaffected, try a different muscle group. Or, simply add a few reps to the opposing muscle group. It’s also important to remember that because you are working in high reps, you shouldn’t use the same weights as when you are maxing out. Using weights that are too heavy can lead to fatiguing quickly and even injury. Each ladder set takes about five minutes, including rest. In 15 minutes, you can complete three ladder sets and walk away with the fat burning and muscle toning benefits similar to 30 minutes in a gym, not counting the commute! Pull-up/Incline Push-up: mid-level incline. Start with your pull-ups then immediately transition into the incline push-ups with an open glideboard. 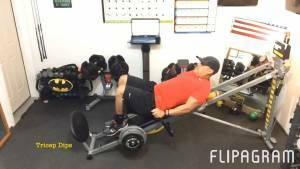 This one truly minimizes rest leaving you with a great level of fatigue in the upper body. Fit Tip: Glideboard should not rest at the top or bottom of the rails. 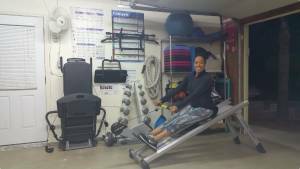 Seated Row/Pullover Crunch: low to mid-level incline. Great for abs, shoulders and back! Torso twist: right/Torso Twist: left: low to mid-level incline. Use one handle to keep it simple. Fit Tip: Keep your posture tall. No slouching! Left Leg Squat/Right Leg Squat: high-level incline. Position your feet high on the squat stand and press into the heel to activate the gluteal muscles. Fit Tip: For added intensity, hold a few dumbbells in your hands! When you’re done, remember to note your levels for each exercise. This will allow you to fine tune the perfect intensity level for each muscle. Have fun – Stay fit!